Createspace Independent Publishing Platform, 9781719152617, 436pp. 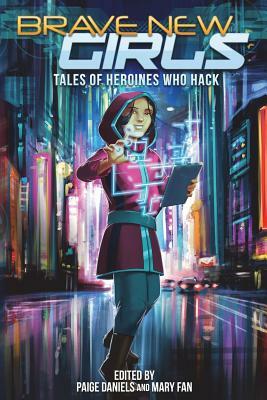 Welcome to the sci-fi worlds of brainy teen heroines who hack not just computers, but whatever puzzles come their way. A scrappy mechanic on an oppressed planet builds a device she hopes will be her ticket to a better future. A fledgling chemist uses her skills to catch a murderer. A teen inventor creates a weapon to battle the mysterious beasts attacking her city. A superhero-in-training puts her skills to the test when attackers strike her compound. A self-styled detective hacks an augmented reality game to solve a dastardly crime. Girls who code, explore, fix robots, pilot starships, invent gadgets, build high-tech treehouses, and more. With tales ranging from space adventures to steampunk to cyberpunk and more this 23-story collection will delight, thrill, and enthrall. Proceeds from sales of this anthology will be donated to a scholarship fund through the Society of Women Engineers. Let's show today's girls that they, too, can be tomorrow's inventors, programmers, scientists, and more. STORIES BY: Lyssa Chiavari, Jennifer Chow, Russ and Abby Colchamiro, MLD Curelas, Paige Daniels, Kay Dominguez, Mary Fan, Halli Gomez, Valerie Hunter, AA Jankiewicz, Nicholas Jennings, Jamie Krakover, Tash McAdam, MJ Moores, Jelani Akin Parham, Selenia Paz, Josh Pritchett, Jeremy Rodden, Aaron Rosenberg, Jenifer Purcell Rosenberg, Jennifer Lee Rossman, JR Rustrian, and Joanna Schnurman. Featuring illustrations by Jacob Atom, Brandon Bell, Jo Belle, Lyssa Chiavari, Sharon Emmitt, Ben Falco, Fauzy Zulvikar Firmansyah, Christopher Godsoe, Liana Kangas, John Kovalic, MunkyWrench, Josh Pritchett, Emily Smith, and Ronald Suh.